Wonder Why You Don’t See Friends in Your FaceBook Feed Anymore? Whether you realize it or not you may have inadvertently not put some of your favorite people in your top 30. That’s right, you only get 30 slots to Follow First on Facebook now. Everyone else gets mixed into the randomness of up to your 5,000 friend limit. How do you check to see if someone is in your 30? You must then edit your list and remove someone in order to replace that slot. Those with blue stars are highlighted and chosen to follow first. To unselect or select, simply click. 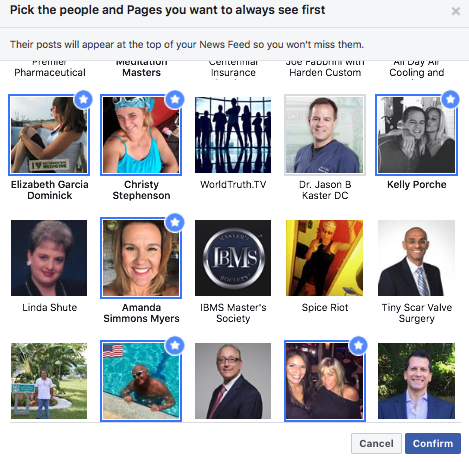 There you have it – you have now revamped your Facebook feed in so far as who you will see posts from first. This also explains the absence of some of your friends!